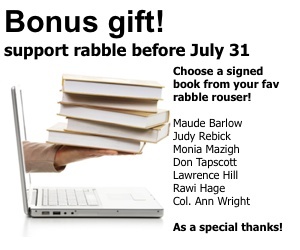 Thank you for your interest in supporting rabble.ca! As a community supported non-profit media site, rabble depends on generous donations from individuals and groups to survive and thrive. rabble gets no government money; we have no corporate parent or primary foundation support. We have you. rabble.ca operates on a tiny budget compared to other online news sites and we make every dollar count and truly appreciate your support. Organizations can also support rabble in a couple of ways. Become a monthly supporter of rabble. Support rabble with a monthly donation of $5, $8, $15, $25, or $50. Or whatever amount you can afford. Click here to sign up now. Make a donation to rabble.ca. It does make a difference. You can make a secure donation right here! Become an in cahoots member (organizations). Share your news with us and we will share it with the world. rabble.ca provides direct links to stories on the websites of our civil society partners on the top of our front page. in cahoots membership is charged on a sliding scale, designed to match an organization's ability to pay, and includes an advertising bonus. Click here to learn more. Become a sustaining or supporting partner (organizations). rabble's sustaining and supporting partners are organizations that support rabble's mission and vision through cash and in-kind support and receive support from rabble in advertising and other forms of promotion. Send us an email for more information - click here to open an email from your browser. Please note that in order to remain independent rabble.ca cannot issue tax receipts.